Clement Matayer, Lola Creton, Felix Armand, Carole Combes, India Menuez. The May of the title is that of May 1968, the month of the student demonstrations and protests at the Sorbonne, Paris. It was a moment of truth in French society and politics, signalling change. This story takes place some years later, focusing on a young man in high school, listening to a philosophical paragraph from Blaise Pascal, the teacher urging his students to think about their situation. The potential for interest in this kind of story is quite strong and has been treated in a number of films, especially Bernardo Bertolucci’s The Dreamers. However, while many audiences may be caught up in this story and its characters, many will not. This review is amongst those who were not. After experiencing some difficulties and threats, some of the group go off to Italy but the young man is dissatisfied there and comes back to France where he is involved, partly-involved, continuing with his art, falling in and out of love, wanting to make films. He finally get his chance to be involved in England when he works at Pinewood Studios in one of those prehistoric kind of films like The People that Time Forgot, but this one has a mixture of dinosaurs and Nazis and a submarine. And there we leave him except that he seems to stand in for the character of the writer-director, Olivier Assayas, who has made a number of very interesting films, but not this one. 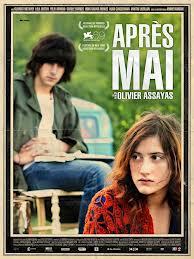 A film for specialists of the period and those who enjoy French films which are a mixture of the morose and the abstract. 1. The director and the range of his career? This film as a memoir? the effect of his early searching on his career? 2. The title, May 1968, Paris, the riots? The role of the students? Ideas, philosophical background, revolution? The critique of the status quo? 20 years after World War II? 3. The settings: Paris, France, Italy? The 1970s? Realism? 4. The central character, class, philosophy, writing? His place in the group? Discussions? The influence of 1968? Into the 1970s? 5. The range of characters, the relationships, age, study, sexual liaisons, international, including the United States? 6. The girl, the hero, their on and off relationship? 7. Dangers, going to Italy, the Italian experience and the effect? 8. The return, times changing, moving in age, relationships, meeting the girl again? 9. His going to the United Kingdom, working in film, the creature-feature? The nature of his work? 10. The director looking back at the influences on his life?